The Hansel and Gretel quilt block is an easy block featuring two frequently used patches -- namely the half square triangle and (my favourite patch) the flying geese patch. But, that is not all. Also in this block, the centre patch is comprised of a much underused (at least in my opinion) patched called the square in a square. All in all this is a simple nine patch block, which would be a good choice for a beginner quilter. 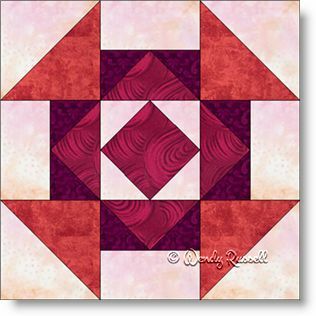 This quilt block might look familiar and it is similar to Texas Shoofly and Churn Dash. See if you can see the similarities. The sample quilts illustrated are both set on point but, as you can see, they look very different in the end. So, what amazing heirloom can you come up with?